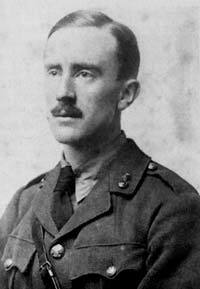 Author John Ronald Reuel Tolkien, better known by readers around the world as J.R.R. Tolkien, was first and foremost, an English language scholar who happened to be fascinated with legends and myths. He began creating one of the most famous works in English literature while grading examination papers with random scribbling about hobbits. J.R.R. Tolkien was born in South Africa on January 3, 1892. When he was only four years old, his father died, and his mother moved the family back to England. However, his memories of Africa stayed with him, including one about a close encounter with a terrifying, exotic spider, and these most likely influenced his writings. In 1904, Tolkien’s mother was diagnosed with diabetes, and she died later that same year. He and his siblings were shuffled between several households before a kindly Catholic priest took responsibility both for their physical as well as spiritual welfare. At this time, Tolkien already could speak Latin and Greek quite well, and was studying a number of other languages, as well as making up his own. In 1911, Tolkien began studying a course of Classics at Exeter College, Oxford University. Two years later, he changed his course of study to English Language and Literature, still focusing, however, on Old English. Even though World War I unleashed its wrath upon Europe in 1914, Tolkien continued his studies at Oxford, graduating in 1915. He married his longtime love, Edith, in 1916, and then went into service for his country. He eventually was sent home to recover from trench fever, a typhoid-like illness. During 1917 and 1918, this illness kept recurring, but he eventually grew strong enough to return to active duty. The armistice for the war was signed November 11, 1918, and Tolkien was prepared for civilian life. He had been seeking academic positions and landed a good one as assistant lexicographer for the Oxford English Dictionary, which was then being compiled. His academic career continued, as did his fantastical linguistic and sociological imaginings. He was creating imaginary societies in his head through poetry, invented languages, and borrowed myths, but he had yet to find a cohesive way to put everything in his head down on paper. Tolkien told his own children original stories, creating an illustrated storybook every year around Christmas. After his first obscure imaginings and initial random scribbling, Tolkien himself became intrigued by his own imagination and began exploring his ideas and rounding out the world of the Hobbit. The Hobbit was eventually published in 1937, to great success. In fact, it was so successful that the publisher asked him if he had anything similar with which to follow up. The work that he was writing was deemed unworthy of being published, and he continued inventing and re-imagining the world of Middle Earth for 16 years when The Lord of the Rings was published as a trilogy in 1954 and 1955 in England and the United States. The initial enthusiastic reader-fans of the trilogy morphed into a near-cult following by the late 1960s, and the “alternative society” took hold of J.R.R. Tolkien’s trilogy as if it were their bible. Tolkien’s beloved wife, Edith, died in 1971, and he died two years later. They are buried in a single but well-marked grave in a cemetery in Oxford’s northern suburbs.